If there’s one thing I do for this site, it’s play a ton of games. 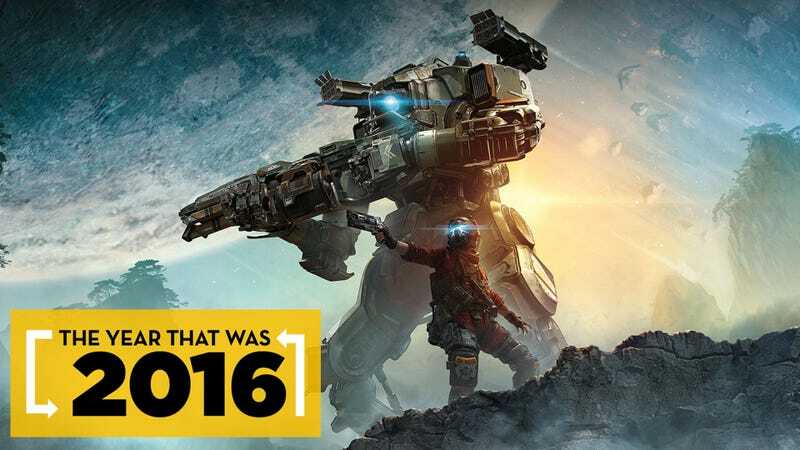 2016 was an amazing year and offered some of the best video games in recent memory. I sat down to list my personal favorites for our year in review. Obsidian’s latest RPG is compelling and prescient given today’s political upheaval. Dropping the player in a world where evil has already won, Tyranny is a game about power. What will you do to get it? What will you do once you have it? The world is filled with difficult decisions from the very start. Opening with one of the most interesting character creators I’ve seen in years, players map out a unique history for their would be overlords. As expected from an Obsidian title, Tyranny is full of interesting characters as well. From a dangerous, soul-consuming god being who speaks in multiple personalities to a companion character who has been encased in armor, every one of them is a true delight. Tyranny grabbed my interest in a way I’ve not experienced since Planescape: Torment. It’s a damn fine RPG that I can’t wait to replay. Clocking in at about two and a half hours, Virginia tries to do an exceptional amount in an incredibly short time. It is the story of two detectives investigating the case of a missing boy. But it is also so much more. Virginia is an experiment in editing. It is a test to see whether or not a narrative game can function without dialog. It is a very deliberate merger of cinematic techniques and gameplay conventions. The end result is messy but spellbinding. It twists and turns like a roller coaster, drawing the player close with a highly empathetic approach that creates one of the year’s most memorable experiences. It’s hard to innovative a genre as well-worn as first person shooters, but Superhot succeeds in an astounding way. Having time move only as you do, gun engagements are less wild shoot outs and more cerebral puzzles. Do you pick up a cueball and toss it at the shotgun dude, or do you risk punching the nearby swordsman so you can use their katana to cut incoming bullets in half? It would be enough for Superhot to offer badass tactical shooting, but there’s a surprisingly acerbic single player campaign here as well. Full of critique for game culture and game design, Superhot pulls no punches and tears into its subjects with an infectious and gleeful confidence. Campo Santo’s narrative adventure brought some of the most three-dimensional characters ever written in a video game. Taking the role of Henry, players spend most of their time exploring the wilderness and talking over the radio to his fellow fire lookout Delilah. Both are painfully human and deeply flawed. Firewatch has a genuine honesty to it. Henry flees from his sick wife, Delilah jokes off her responsibilities, and the secrets of Shoshone National Forest are far less nefarious than one might expect. This is a game about misunderstanding and fear. Fear of growing old. Fear of making mistakes. Fear of being stuck in a boring life you never asked for. I can’t think of a title that approaches these sentiments with the same maturity as Firewatch. In a world dominated by space marines, magical inquisitors, and giant robots, Firewatch remains grounded. It’s a real gem and a genuine achievement in storytelling. Quadrilateral Cowboy is a strange game. Blendo Games’ puzzler combines deft level design with a core mechanic focusing on light programming. The end result is one of the best puzzle games since Portal. There’s a true sense of accomplishment that comes from planning a perfect heist and executing it. Plot the correct path and typing the right commands is an intoxicating process that feels crafty and sly. Packed to the brim with Brendon Chung’s idiosyncratic wit and art direction, Quadrilateral Cowboy is entertaining and a wonderful challenge for your intellect. Blizzard’s team-based shooter is like digital cotton candy. Every play session is a treat. Impeccably balanced, ever-expanding, and consistently exciting, this is the team-based shooter I’ve always wanted. The world of Overwatch is equally wonderful. It is filled with heroes of all stripes and delivers a hopeful message that really resonates with the optimist in me. Even when my team is behind, I always feel driven to press forwards because that’s what heroes do. Overwatch has become a fixture of my weekends. Playing with friends or even just doing one-on-one mystery duels is a great way to pass the time. I haven’t played a game like this since Team Fortress Classic. Fast and bright, Overwatch is pure fun. Doom is one of this year’s biggest surprises. After a lackluster premiere trailer, I expected a joyless slog that failed to understand what made the original games so special. Thankfully, Doom gets it right. It is bloody. It is explosive. It is loud and violent. There’s a sick pleasure to bashing in an imp’s head or ripping out a cacodemon’s eyeball that can’t be found anywhere else. Bethesda and id created something really special here. Doom is both a triumphant return to the exciting shooters of yesteryear and a stealthy satire of player-centrism and power fantasies. This game is a remarkably well-crafted and worthy entry in one of gaming’s greatest franchises. Placing Final Fantasy XV so high of my list was a difficult decision. In many way, this game is irredeemably broken. The plot falls apart in the third act, the combat is hard to manage, and the dungeon design is a snore. But underneath all of this is a game with heart. The main cast are incredibly likable, the villain is one of the franchise’s best, and the game world is astoundingly well-realized. I want to live in this world and explore it to the fullest. It is gorgeous and full of a richly-implied history. Driving on the road or walking through the woods feels just as satisfying as any of the exploring I’ve done in The Witcher 3. There’s a feeling here that is hard to explain, a magical and astounding warmth that comes over me as I play Final Fantasy XV. In spite of the game’s clear flaws, I feel completely content in its world. This feels like Final Fantasy, and I love every second of it. This game is amazing. Taking the role of a bartender in a cyberpunk dive bar, you interact with a host of characters as they struggle to get by in their day-to-day lives. Sometimes it’s a future cop with a heart of gold, sometimes it’s an experimental brain in a jar just looking to relax. At the end of the day, they all come in for a drink and a sympathetic ear. VA-11 Hall-A is tremendously well written. I came to care for every customer and become fully invested in their lives. Its tone is impeccable as well. Mixing drinks is a relaxing process, and the game’s soundtrack is delightful. It’s not without problems however, and I don’t begrudge folks who pick it up and bounce off the more 4chan inspired elements. There’s a strange melancholy to VA-11 Hall-A. A subdued and understated approach that many games seem to lack these days. It’s a beautiful game that ignited my imagination in ways I did not know games could. I don’t know how this game is possible. Titanfall 2 is so good and so well-crafted that it rightfully earns a place alongside genre-defining titles like Half-Life and Quake. The fact that it underperformed in the face of games like Battlefield 1 and Infinite Warfare is downright sinful. The single player has some of the best level design ever put into a game and offers blisteringly fast gunplay that no competitor can hope to match. Every moment is brilliant. When I play it, I feel like I’m Salieri listening to Mozart. This game is not just good. It is miraculous.